The Matenadaran after Mashtots published the examinational original of authorial autograph manuscript “Usumn Bzhshkutyann E Ays” of chief-physician Amirdovlat Amasiatsi (15th century). 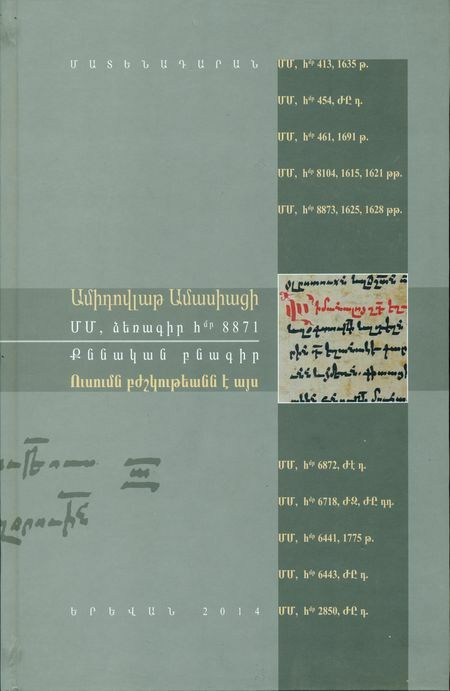 Donara Karapetyan published this book, and the above-mentioned work is presented with scientific commentaries and scientific-comparative analysis with 10 homonym manuscript versions, which are in the depository of Matenadaran. In the introduction of the work are presented the parts of biography of Amirdovlat Amasiatsi that are related to his scientific activities, thereupon there are above-mentioned medical book’s sources and structure, and in the conclusion there are analysis and evaluation of the medical book. The Matenadaran after Mesrop Mashtots and the “Friends of Matenadaran” Foundation announce their gratefulness to philanthropist Maksim Hakobyan for sponsoring the publication of this work.